Many of the buildings in the city use pale stone or pale marble or are painted and in subtle or subdued colours with tones of cream and stone and soft grey. Or maybe subtle is the wrong word - because the ochre of the Nyboder houses could hardly be described as subtle - but these colours provide a solid and a calm background to the life passing by and passing through these buildings. There are few sharp pastels, few day-glow colours, few sharp or acidic colours but toning down colour is not boring and nor is it a safe or an easy design option … it is possible to get it wrong, particularly when colours on neighbouring buildings do not work together … so going for a stone or grey or off white colour it's not a lack of design … very much the opposite because reducing the palette range means that the juxtaposition of tones becomes more important with darker or lighter tones defining architectural features by making some parts set back and some break forward in order to emphasise planes or emphasise details or pick out a pattern or carving or texture or moulding. The east lobby of the Design Museum is a fantastic space that some people might, initially, find boring but it is like a quiet and carefully-constructed poem in tone and texture with subtle contrasts so juxtaposing smooth dark grey marble with the warmer, softer and broken textures of the grain of the wood blocks of the floor and contrasting those surfaces with the deep, matt wash of grey across the walls. This did not happen by accident but is the consequence of considerable thought and careful choice. Even within the museum there are different sets of these tones. 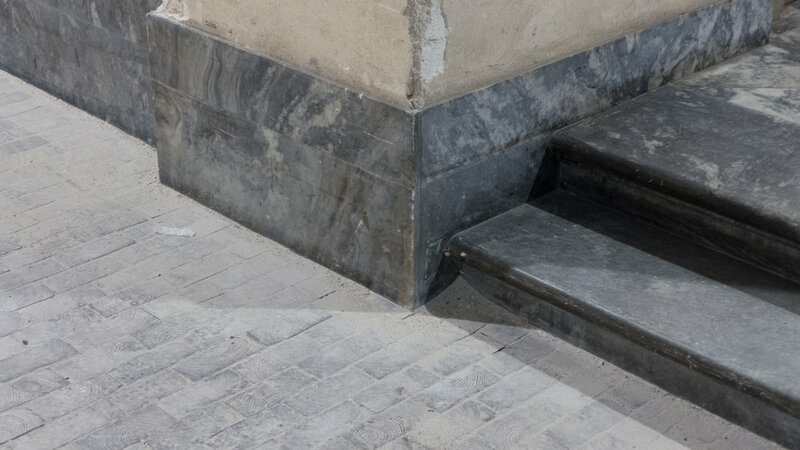 On the staircases flanking the entrance there are much greener tones in the soft sage colours of the stone flooring and painted handrail and dado of the woodwork of the staircase. Away from the main shopping streets, electric lighting in the city is kept low … that's both the level of light is surprisingly low and, generally, the height of street lights is low … a lot of lights are fixed to buildings at about first-floor level although in some streets some fittings for more general lighting are suspended from wires strung across the street but there are also various forms of low-level lights along footpaths and custom lighting on slopes and steps at ground level so light rakes across the footpath. On some paths and steps, there are even lights along or under handrails. As the sun gets lower, the sky goes through violet and mauve colours that deepen to navy and then, as artificial lighting takes over, there are washes of colour - the colours of the bricks or the stone or the render - tailing off into shadows that mark or define many facades and for modern, glass-clad buildings, it is often at night that the interior arrangement of offices and staircases and walkways is revealed. For a city where commerce is so important, there is surprisingly little advertising with neon lighting … so around the town hall square and along the street towards the train station, where it seems appropriate, and otherwise on a few major apartment buildings like those on the Islands Brygge side of Langebro or along the lakes where you can find the famous Irma hen laying eggs. Shop fronts are illuminated but signs are often painted and might or might not be spot lit for night time rather than being back lit. So, for a large and densely-populated city, light pollution is relatively well controlled. It is still possible to walk around the central harbour and see lights reflect up off the water sparkling with light from cars and from buildings and with the light from boats. Another interesting Copenhagen experience is to walk through the residential areas and witness the Copenhagen 'no-curtains' habit. Talking to someone working in the design industry but who lived over the bridge in Malmö, she said one guilty pleasure she had was to walk around the city in the evening to look in through windows to see how people in the city live and how they furnish their homes. Arne Jacobsen Architect & Designer, Poul Erik Tøjner and Kjeld Vindum, Dansk Design Center 1999. 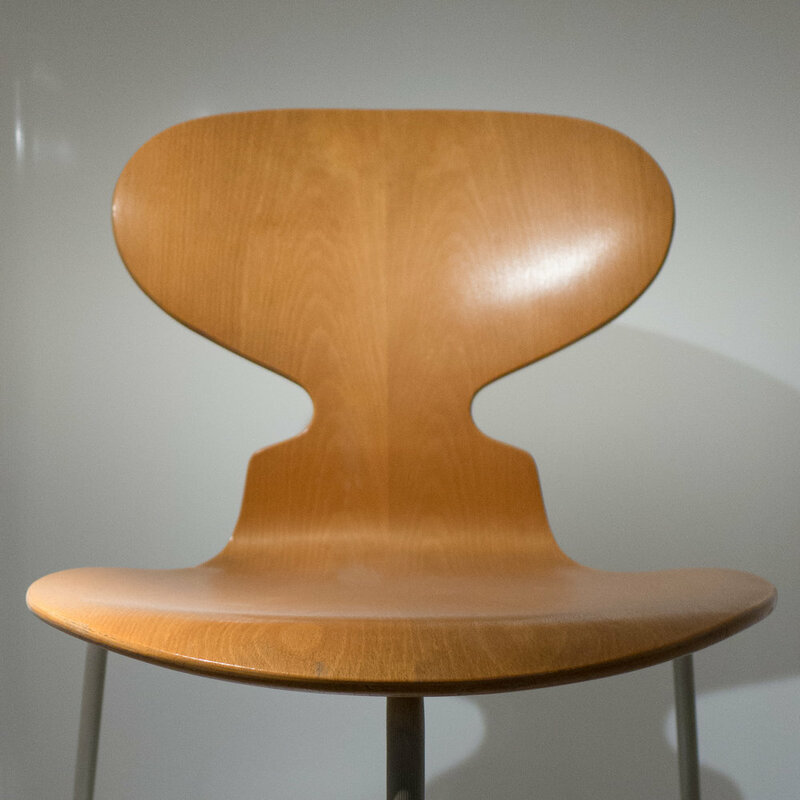 The Ant Chair was designed for the canteen of Novo Industry - the pharmaceutical company - or rather - the story is that Arne Jacobsen had designed the chair but Fritz Hansen were not convinced that it was viable commercially. 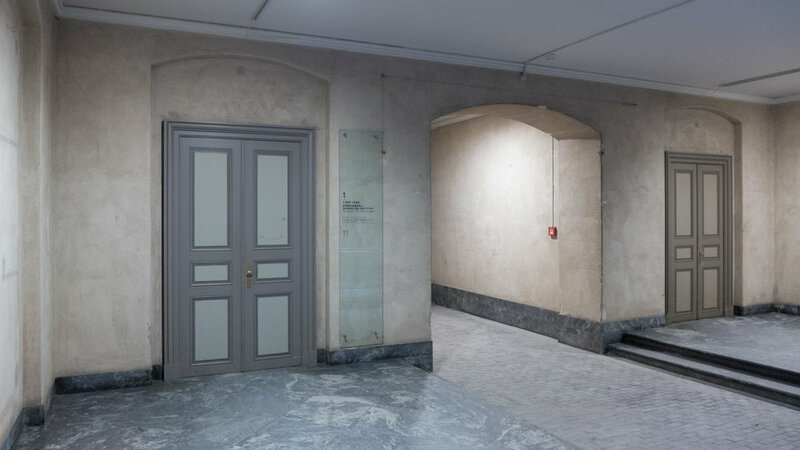 When a director from Novo visited the drawing office to discuss work on the design of new buildings for Novo and admired the chair, he asked Jacobsen about the design. 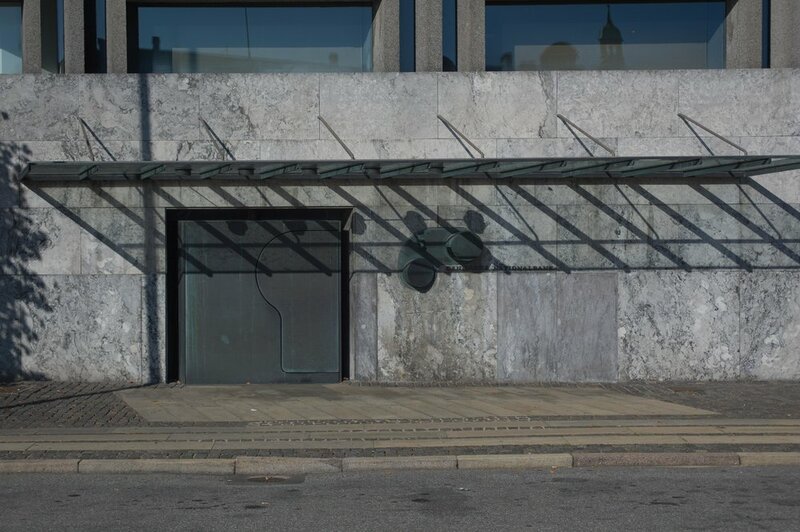 Jacobsen told him it was for the canteen at the new factory and so secured an order for 200 that convinced Fritz Hansen that the design should go into production. This was not an industrial design, as such, but the design for an industrially manufactured chair for everyday use. 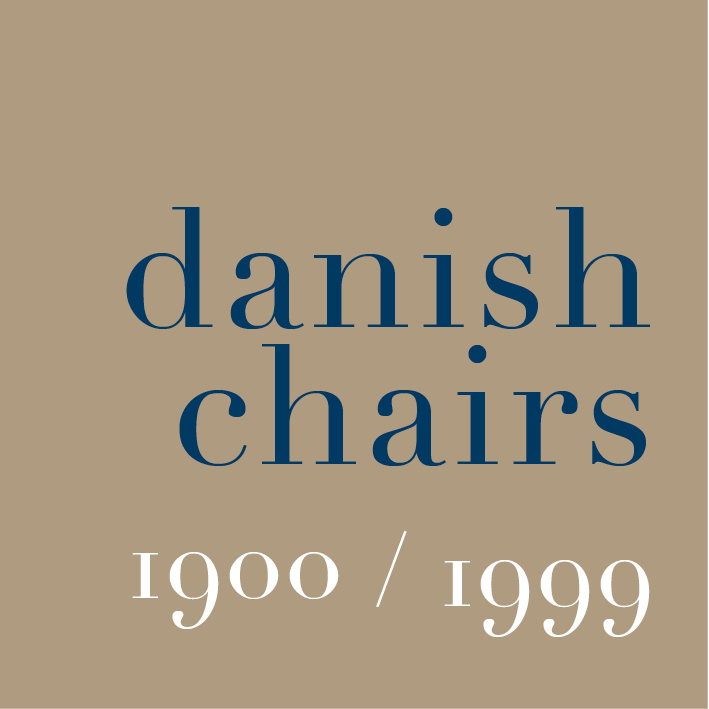 It was launched by Fritz Hansen on the 24 October 1952, on the 80th anniversary of the company, and was shown first at the Danish Society of Arts and Crafts exhibition in Zurich and then at the Danish Museum of Decorative Arts in January 1953. 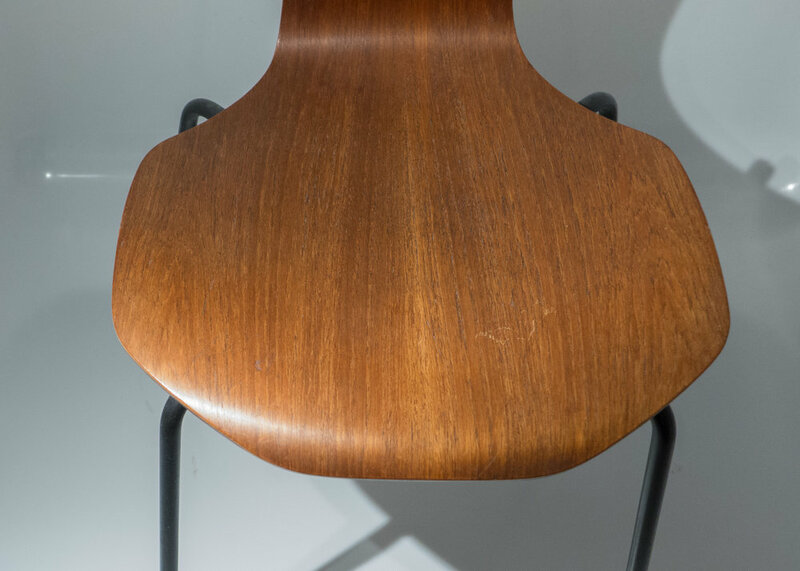 When the chair first went into production there was a choice from four types of plywood - beech, oak, walnut and teak - and a version finished with black lacquer. Later palisander and Oregon pine were added to the range and there was a version with coloured felt glued to the front face of the seat and the back. Jacobsen designed the chair with three legs and despite requests for a version with four legs, he objected to the idea and it could not be put into production until after he died. The legs in steel are held in place at the centre of the underside of the chair with rubber spacers so that they do not sit against the plywood but also to stop the legs twisting or moving sideways if someone using the chair shifts their weight. 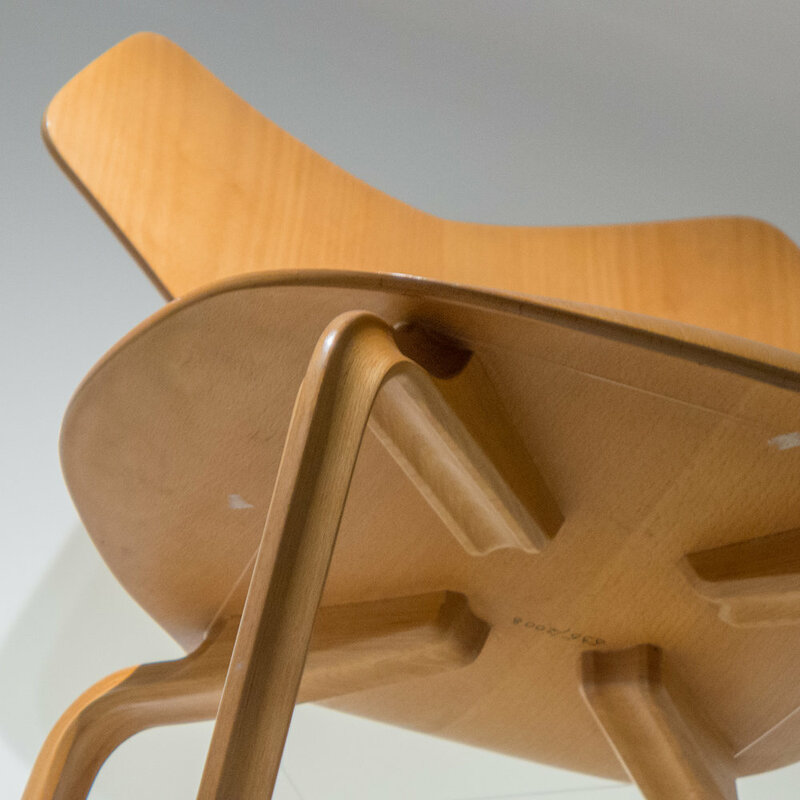 The Ant was the first Danish chair that was made with a single shell in plywood that is curved in both planes to form a seat and back in a single piece of laminated wood. 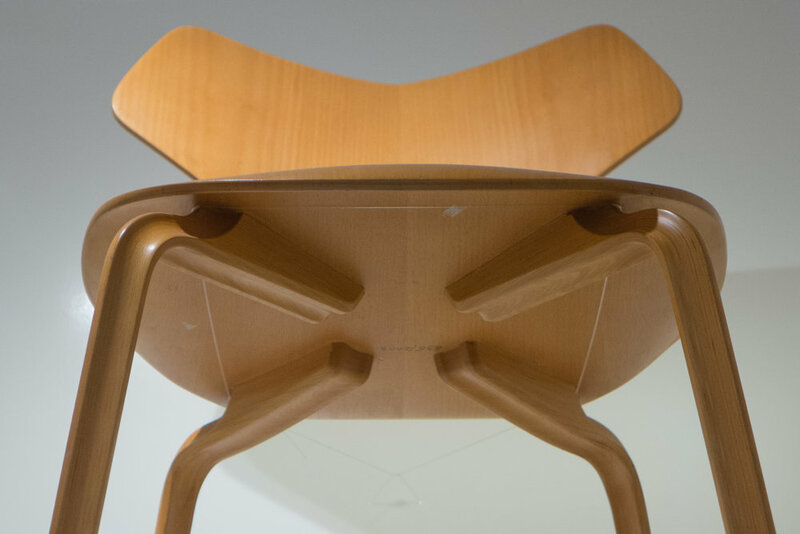 Charles and Ray Eames and Eero Saarinen experimented by cutting slits into the plywood to form a complex shell but Jacobsen achieved a sharp curve between the seat and back while also forming spoon-shaped hollow curves across the width of the seat and the back by reducing the width of the shape at the centre. That is the simple if unromantic reason for the distinct shape of the chair. The Ant Chair is light in weight and stacks so it was used in public spaces like meeting rooms and lecture rooms. People remark that the chair has a decorative effect particularly when a number are set out in a space together in rows which creates a strong and undulating pattern reminiscent of fish scales. In an interview Jacobsen revealed that he had considered using plastic rather than plywood but had rejected the idea because it would have made the chair too expensive - mainly because production of a moulded plastic shell requires an investment in expensive machinery. A small and elegant chair designed by Arne Jacobsen for Munkegård School in Copenhagen. It is sometimes referred to as The Mosquito. 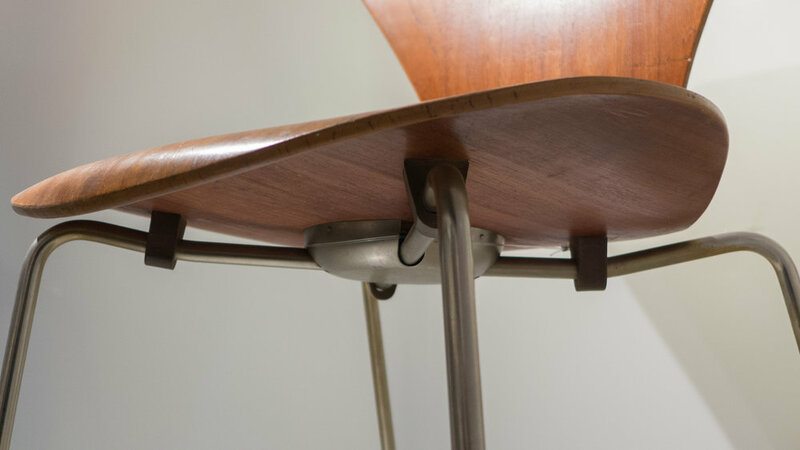 Versions were produced by Fritz Hansen in beech, teak and stained black. The chair has been in production several times but is not currently available. Jacobsen designed the elementary school that was completed in 1957 and, as with so many of his major projects, he designed so much more than the structure, designing the paving and planting of the courtyards, fittings including lighting and, with the chairs, Jacobsen also designed a school desk in plywood with a metal frame. The design of the desk has a simple flat top or writing surface that is bent to run down the back and then back under the top to form a shelf for books. The front edge of the shelf was turned down in the same way that the front edge of the chair seats was angled down to protect the back of the legs. The frame of the desks also included a hook on one side for hanging a school bag. The chair was designed by Arne Jacobsen in collaboration with Dr E Snorrason who gave advice on how to improve the lumbar support provided by the back of the chair. There is a sharper and more pronounced curve at the base of the back and the top of the back has a more generous width to support the shoulder blades. 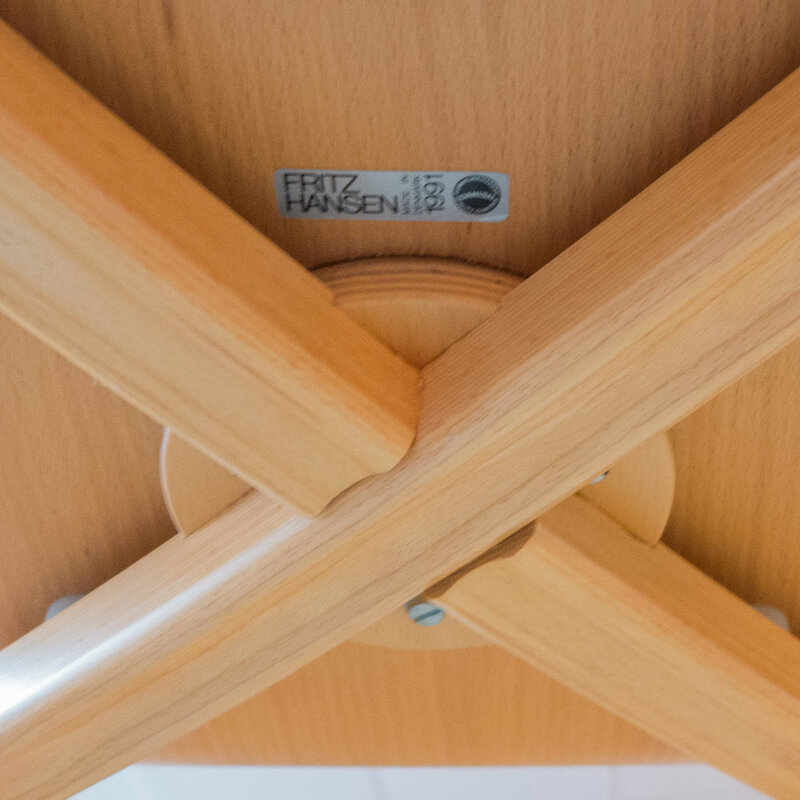 The initial version made by Fritz Hansen was produced using a plywood faced with teak ... then popular and normally implying a more expensive piece of furniture. With fairly straight sides to the seat and angled front corners rather than a smooth curve, the chair is more angular than the other shell chairs by Jacobsen - almost octagonal. There was a version of the chair with a swivel frame with wheels so that it could be used as an office or desk chair. smaller versions of the chair with seat heights of 36 cm and 34 cm were made for children. The chair was shown at the XI Triennial in Milan in 1957 - where the design was awarded the Grand Prix from which it takes its name - and then shown at Charlottenborg, in Copenhagen, later in the same year. 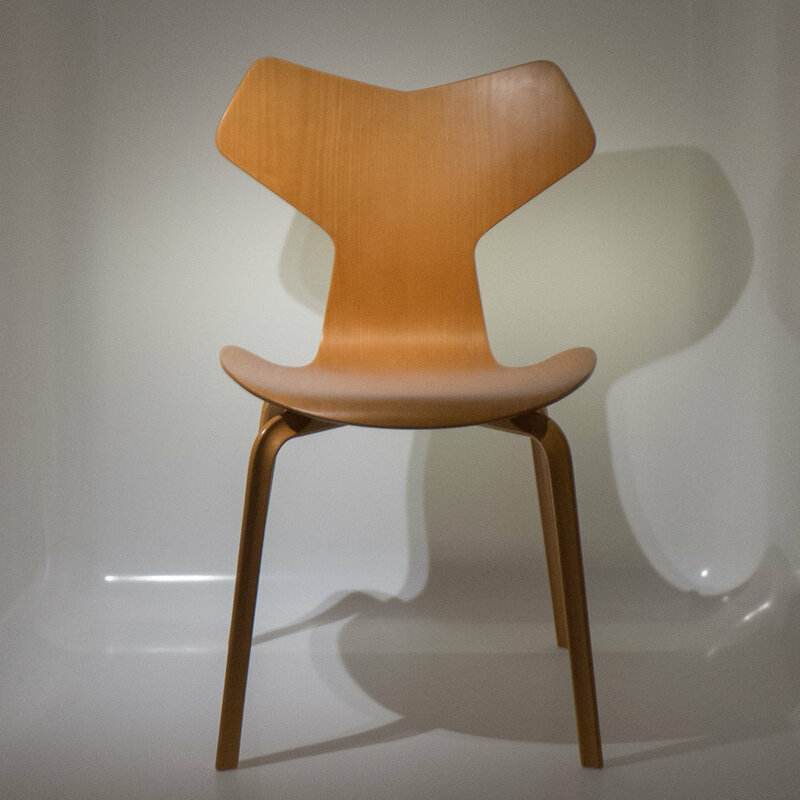 In the original version the shell was made with a teak or beech finish or the chair could be upholstered. The shape of the back is closely related to the FH3103 but here, rather than a straight line across the top of the back, the back has a truncated or stumpy Y shape that makes it, somehow, almost anthropomorphic. There is a pronounced scooping out to the shape of the seat and at the front a pronounced down turn or lip. Initially the chair had four separate legs that were L shaped and in laminated beech with a strong moulding to the cross section presumably, in part, to make it look less solid or less heavy. The legs mimicked the profile of the metal legs on the other shell chairs so were angled out towards the floor and at the top were curved but under the seat they were shaped to form a long hammer or hockey-stick shape to form as long a face as possible along the top for the legs to be glued to the underside of the shell. This proved to be unstable - presumably under the weight of a person the centre of the seat moved down or the legs splayed out and even if the glue of the leg held then the face layer of the plywood would presumably split away from the layer below. 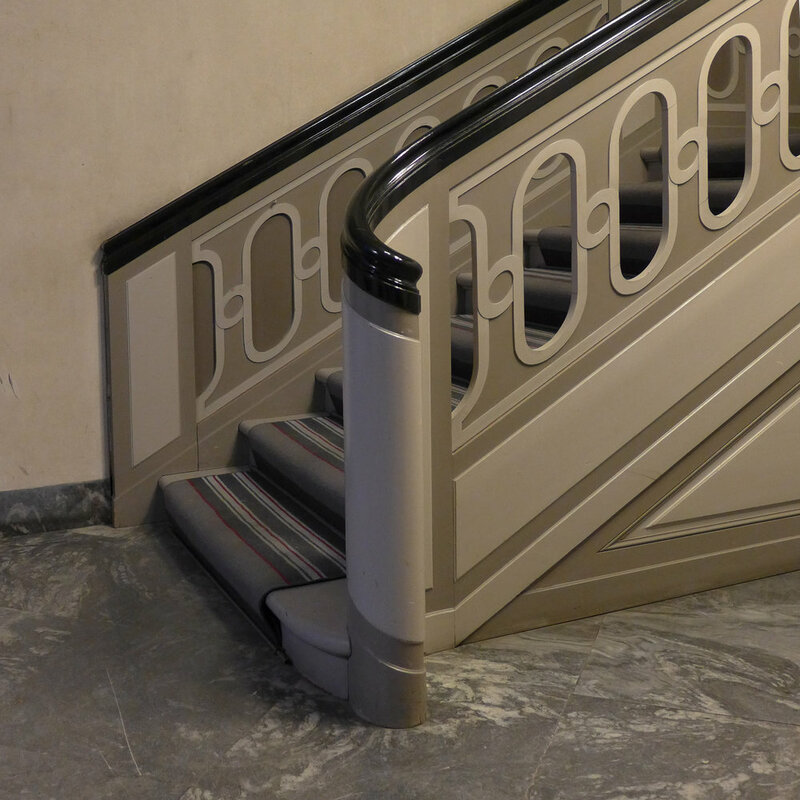 The design was changed and the individual legs were replaced with two n-shaped pieces of steam-bent beech that cross at the centre where they are halved over each other to form a robust join and fixed to a circular plywood plate at the centre of the underside of the moulded shell. That form is closely related to the frame of legs in wood made for the Giraffe - the dining chair that Jacobsen designed for the SAS Royal Hotel. 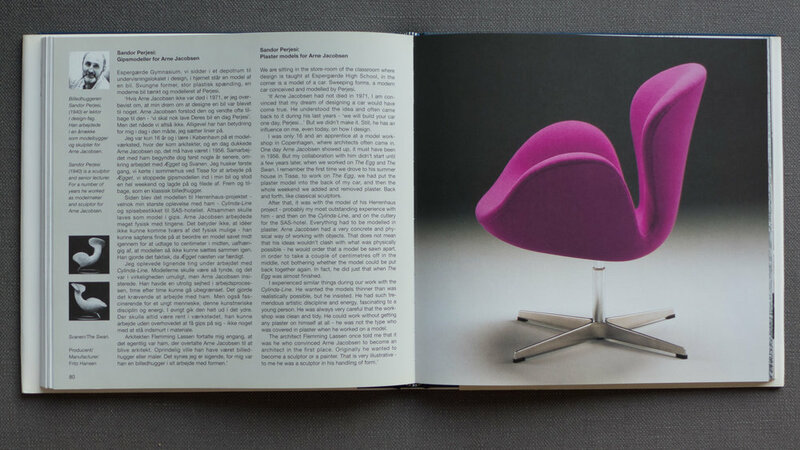 A version of the Grand Prix chair with steel legs was also produced and in catalogues is identified as model FH3130. Alvar Aalto produced several variations on the design of the Paimio cantilever chair of 1932 including versions with upholstered or padded seat and back. 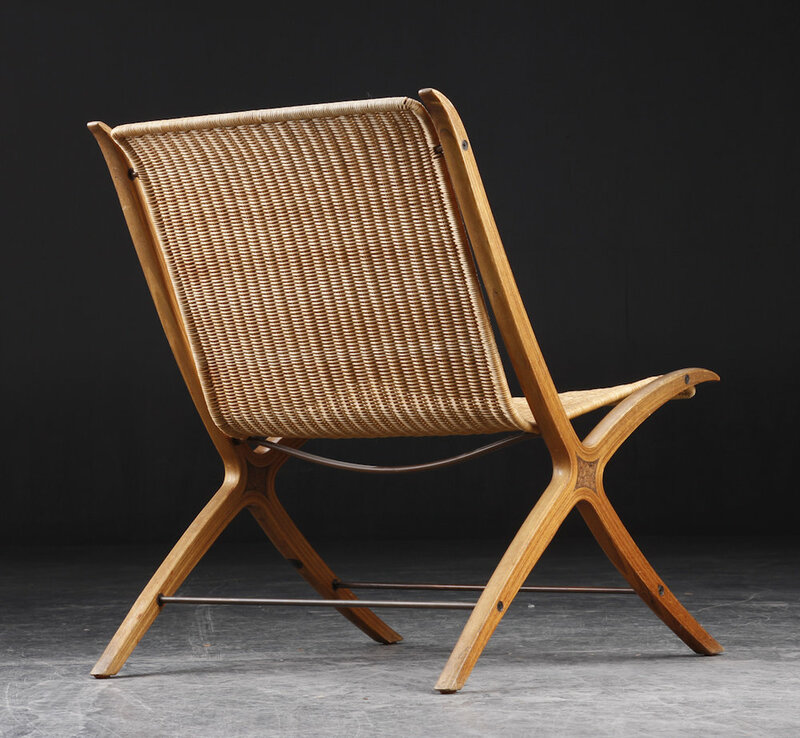 Chair 406 - designed in 1939 - is interesting because Aalto reused the design of the cantilevered bentwood frame from the earlier Paimio cantilevered chair but with webbing woven across the frame for the seat and back rest rather than moulded plywood. This seems to acknowledge the limitations when it was still only possible to curve plywood in one plane … so forming what is, in effect, a scroll shape along the length to form a seat that then curves up to form the back from a single piece of plywood but without also being able to scoop or hollow out the profile across the width of the seat. The main part of the cantilevered frame of the 406 is a simple elongated H (172cm by 57cm) in laminated wood with the uprights of the H bent to form the runners, the front supports, arm rests and short uprights on either side of the back rest. 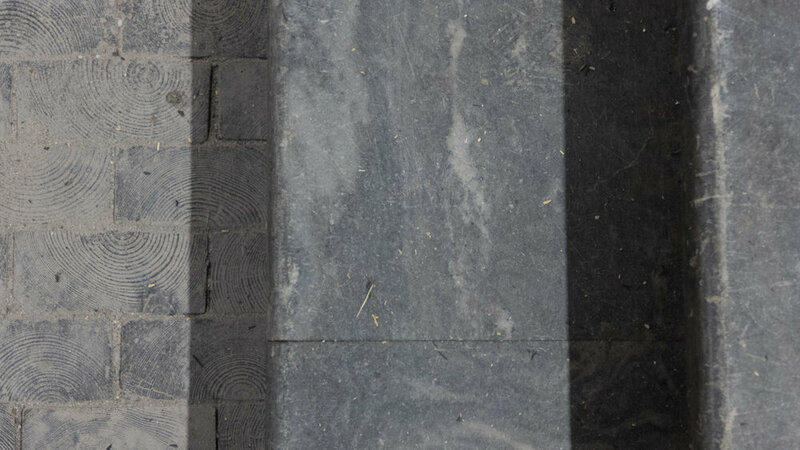 These main lengths are rectangular in cross section - 1 inch by 2¼ inches (25mm x 57mm) and set flat for maximum strength and flexibility. The crossbar of the H supports the seat and the frame thins down immediately above that cross bar where the curves are tighter and slightly more flexibility is required. 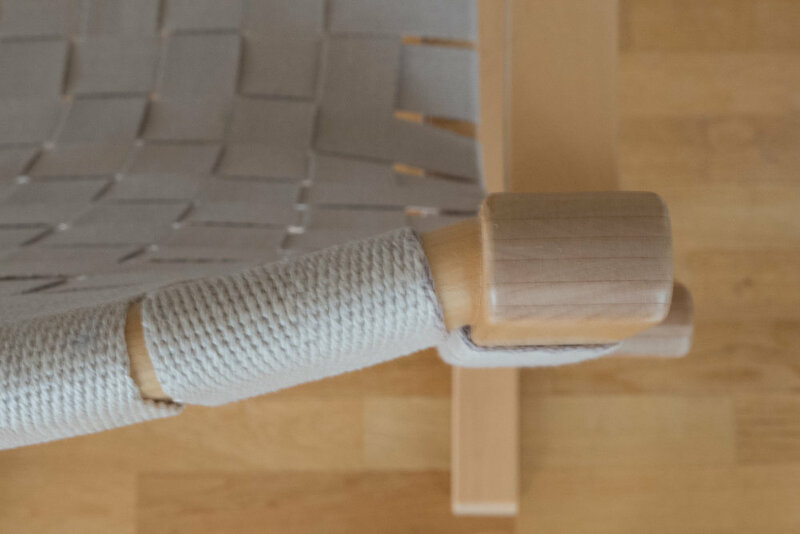 A simple and separate rectangular frame (110cm by 46cm) for the webbing, is bent to a shallow curved shape that forms the seat and the back rest of the chair. 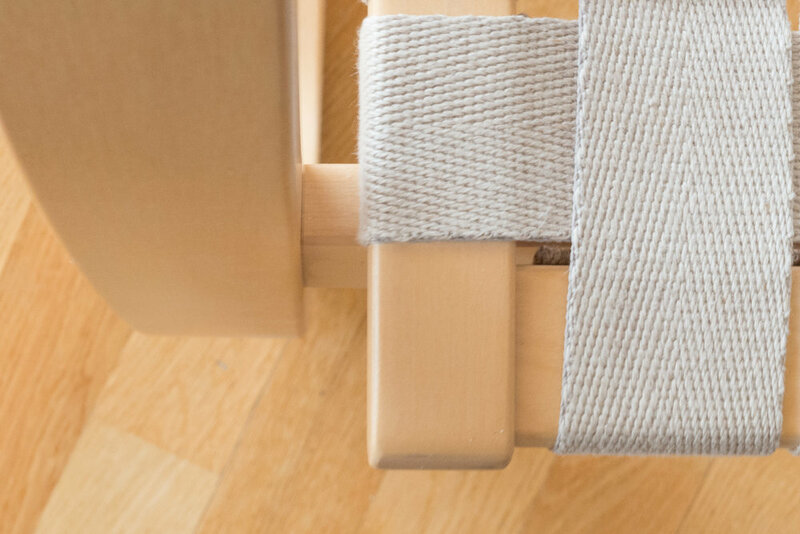 The webbing is two inches wide and is taken across the frame and returned underneath and round and nailed or, in the modern chairs, stapled onto the inward facing edge of the frame. The only other piece of timber is a stretcher, fixed across the back with screws, just above the seat to keep the side pieces of the frame a consistent distance apart and parallel where otherwise they could be forced inwards with the weight of a person sitting in the chair pressing down into the webbing and potentially moving the sides together. There are remarkably few points of contact between these two parts - between the side frames and the frame of webbing that forms the seat and back and with the pronounced cantilever it reinforces the impression of the seat being suspended in space. Where the seat rests across the cross bar there are long screws - one on each side - that are countersunk and fix the seat frame in place from below and at the top of the arm rests, where the side frames are nearly vertical and running parallel to the back rest, they are fixed together with, I presume, hidden or blind dowels rather than taking a bolt or screw through to link the pieces. 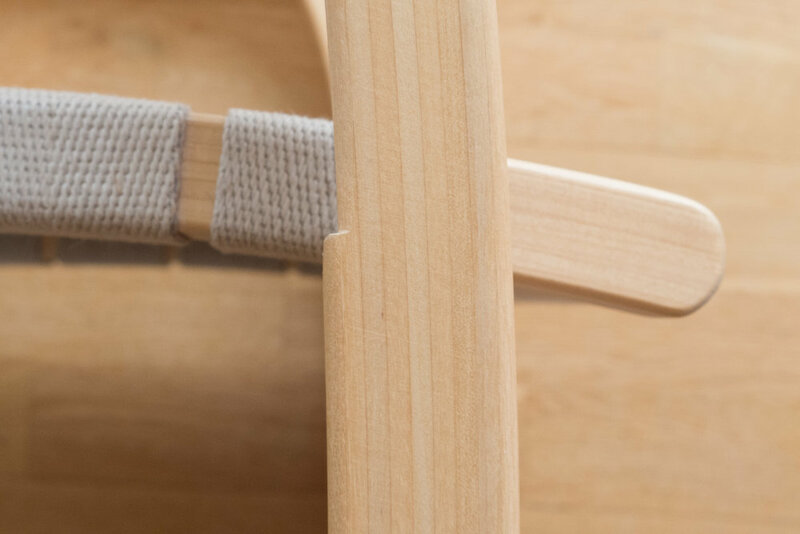 The cross bar of the H-shaped frame and the corners of the frame of the seat / back are fixed with simple butted joins that are glued and again there must be hidden dowels through to fix and hold square the separate pieces. This form of construction is simple and honest and takes straightforward skills, with the holes drilled and controlled by jigs or patterns, but cabinetmaking skills are not required. The form and construction of the chair reflects honestly that it was designed to be made in a factory system rather than in a cabinetmakers' workshop. That does not stop this being a sophisticated and elegant chair. The design has a clarity and deceptive simplicity with precise curves and the angles of the front and arm rests giving the chair a much less angular profile than the comparable Bauhaus chairs in tube metal … so, for instance, the seat is not simply folded but rises up slightly towards the front and then dips down slightly once over the cross bar and the top bar of the back rest is gently curved. There are clear contrasts with Danish furniture. The 406 has a good sitting position with high back support but it is not a chair in which to move around and, although the design is good looking and dramatic, it is certainly not to be seen from the back. It is a relatively light chair that weighs just 6 kilograms - although, for comparison, the Wishbone Chair by Hans Wegner weighs just 4 kilograms. In some ways Chair 406 is similar to but not strictly comparable with the Safari Chair - because it does not fold - but it is light and informal and is certainly good for use on a terrace or balcony although, with the webbing, obviously not weather proof.